The following is a poem from mother Samantha about her child’s first day at school. The trust we place in teachers to really value our child as an individual is huge. The first day always comes with anxiety and fear no matter wether its your first child or tenth. Dear teacher up until today my child has been my responsibility. To feed, to bathe, to entertain, to keep safe. But for part of the day I have to let them go. I have to pass them over to you. I have to walk away. 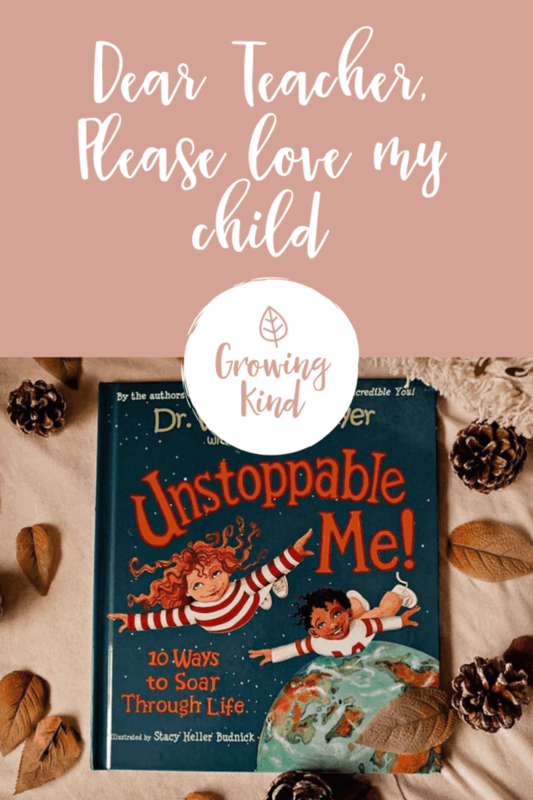 Please love my child like I love my child. Please keep them safe from harm. Please protect them from the actions of others. Please shelter them in your classroom and nurture their kind heart. Please don’t embarrass them when they make mistakes, please don’t show your disappointment or speak harsh words to them. For they are only little, fragile and impressionable. They aren’t ready to face the big world on their own. I’m not ready to let them either. Hold their hand like I hold their hand. Not too hard that their fingers become squished and they feel restrained. Not too soft that their fingers slip from your hand and they are once more alone. They grew in my womb and they grew in my heart. I can count the hours I’ve been away from them. I know how much vegemite they like on their toast. How they like their hair to be parted. Which pillowcase is their favourite. Which socks they find itchy. Which teddy is their bestie. And when they’ve had enough and need a cuddle. I know what breakfast cereal to serve and which one not to. Which things they are afraid of. And what they aspire to be. I want to tell you all of this but instead I say “Good morning”. I want to tell you that today they are sad or happy or afraid. But instead I say “Have a good day.” And I smile because I want to be happy for them but really I want to take them home with me and cuddle them and keep them close to my heart where they are warm and safe and loved. They’ve always eaten when they needed to and now they have to wait. They’ve rested when they needed to and now they have to push on through. They are used to having physical contact to soothe their bumps and calm them down when they need it but now they have to settle for high fives and paper towel wrapped ice packs. They are used having me to themselves but now they have to share the adult attention with lots of other little people that aren’t used to sharing the attention either. Sometimes they will be overwhelmed and they’ll look for you and you’ll be busy and you’ll want to send them away. Back to their seat, back to the mat, back out the door. But take one moment to listen and to care. Take one moment to show them that their little worries and little aliments are worthy of your time and attention. They like to sing. They like to draw, paint and colour. They aren’t used to being told how to do these things. Their expression is free and natural and their own. Please don’t make them fit the mould, follow the rest, be the same as the ones that came before them. Please nurture their creativity, their personality, their soul. It doesn’t matter if they need more time to do things, or aren’t ready to speak up just yet. It doesn’t matter if they can’t draw or write or count just yet. There’s plenty of time for that. What they need is to know they’re safe. That their thoughts and feelings matter. That they can come to you in times of need. I don’t expect you to work miracles. I don’t expect you to be me. But when you look into my child’s face please smile with soft smiles and speak with kind words. They are little and they are learning. Dear Teacher, love my child and keep them safe and nurture their kind heart. Get to know them. Get to know about them. Learn what makes them tick. And soon you will love them like I love them. And you won’t want to let them go.